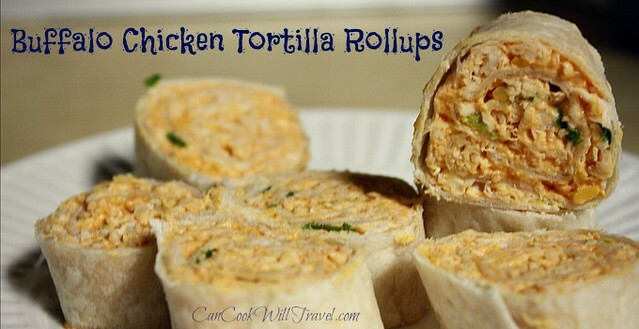 Buffalo Chicken Tortilla Rollups will be yours in no time. 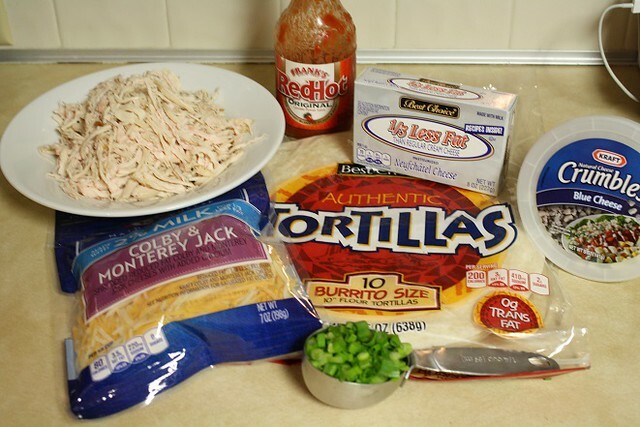 Here’s what you’ll need: One pound of shredded Chicken, a cup of Colby-Jack shredded Cheese, Hot Sauce (Frank’s is pretty classic here), 10″ Flour Tortillas, 1/4 cup of Green Onions, 8 ounces of Cream cheese (I like the 1/3 Less Fat kind), and 1/4 cup of Blue Cheese crumbles. 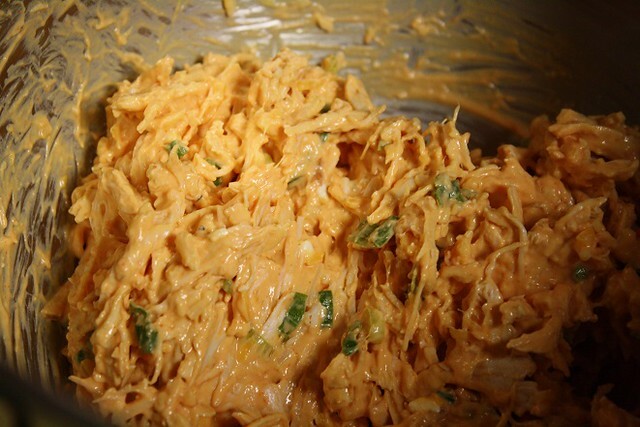 Get started by putting all of the ingredients but the chicken and tortillas in the mixer. That includes the cream cheese, hot sauce, blue cheese, colby-jack cheese, and green onions. 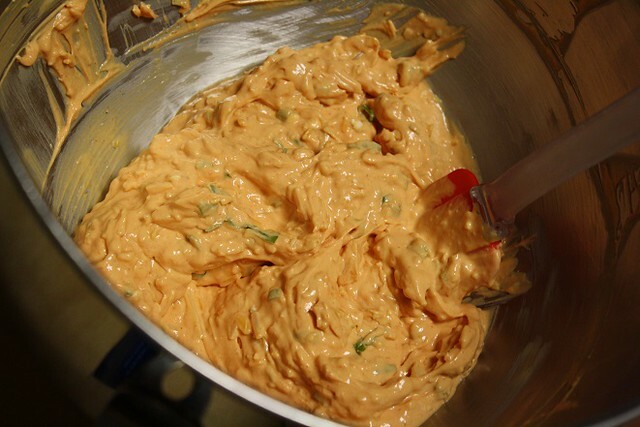 Combine the cheese and hot sauce mixture until it’s well blended. 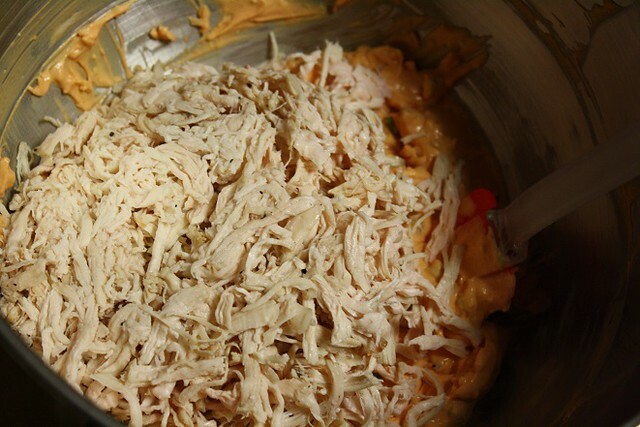 Use a spatula and fold in the chicken so that it’s completely combined into the cheese mixture. Place a tortilla on your work surface. Put 3/4 cup of the chicken mixture in the center of the tortilla. 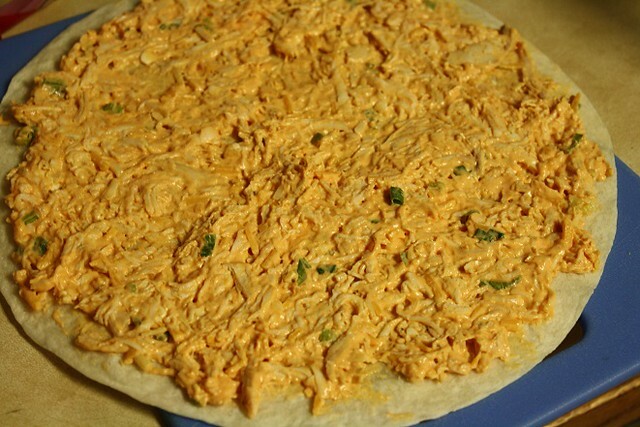 Then spread out the chicken over the surface of the tortilla. You can get it pretty close to the edges here. Tightly roll the tortillas up being careful not to cause the mixture to get moved around much so that it creates a pretty pinwheel look. Then wrap up the tortillas in plastic wrap and refrigerate for a couple of hours. Once the tortillas have firmed up, cut each tortilla roll in half. Then cut each half in about 3-4 pieces. You’ll be left with an end here that isn’t too pretty but it’s important you eat it…for quality checking purposes of course! 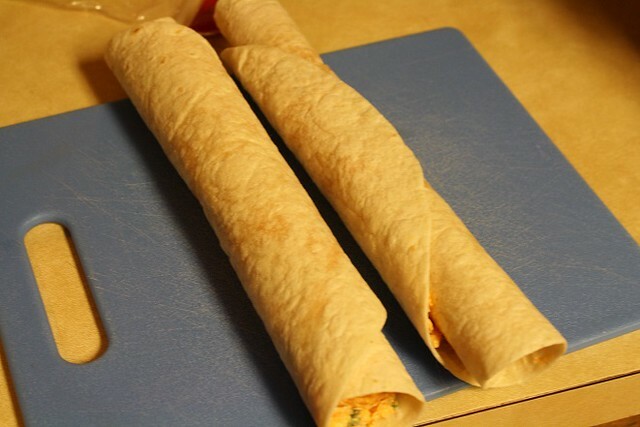 Place the cut rollups on a serving plate and enjoy! Trust me, you will enjoy! Happy rolling! 1. Begin by prepping your ingredients. Cut up your veggies and shred your chicken if you don’t have any preshredded. 2. 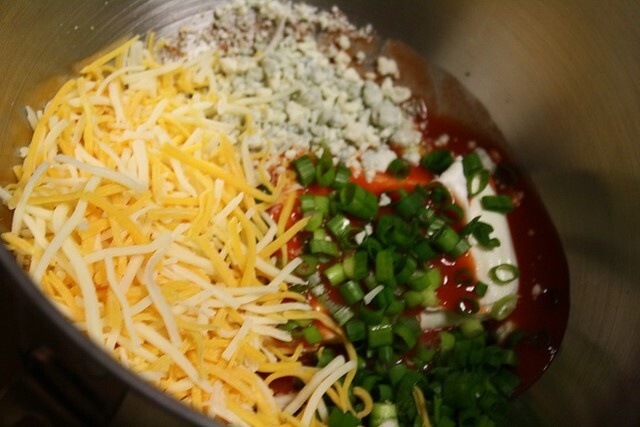 In a mixing bowl, combine the cream cheese, hot sauce, blue cheese, colby-jack cheese, and green onions. Mix on medium speed unitl the mixture is well combined. 3. Add the chicken to the bowl and fold it in by hand until the mixture is totally uniform. 4. At this point you can refrigerate the dip on its own if you aren’t ready to put the tortillas together. Otherwise spread about 3/4 cup of the chicken over the tortilla. 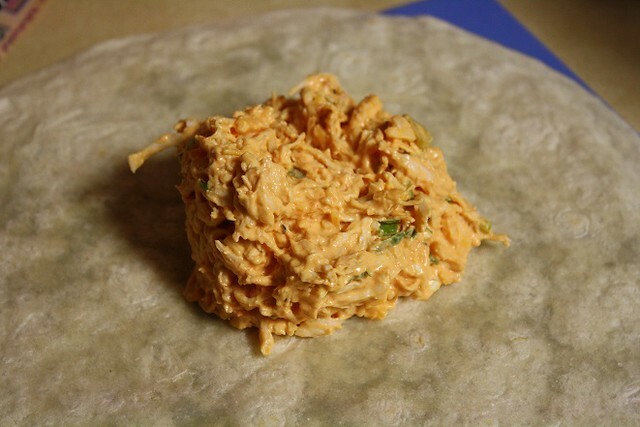 You can get pretty close to the edges, and then roll up the tortilla tightly being careful not to cause the chicken mixture to move around as you’re rolling. 5. Refrigerate the rolled tortillas for about 2-4 hours so they firm up a bit. I covered them in plastic wrap in the fridge. 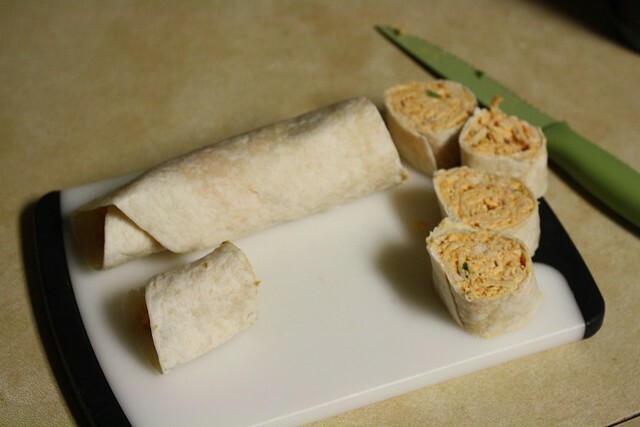 Then cut the torilla roll in half. Then cut those halves into 3-4 pieces. You’ll be left with ends that aren’t as pretty but are still pretty darned tasty so you can quality check! 6. Serve these up for your friends and family for your next party or snack time. Then dig in and enjoy! Previous Post: « Sriracha Shrimp and Zucchini Lo Mein = One Damn Good Dinner!